Nestled in the summit of a splendid hill, which dominates the Sienese countryside with its patchwork of cypresses, Villa Catignano is a beautiful and historical jewel, the ideal location for anyone who desires a romantic and unforgettable wedding. Villa Catignano was built in the late XVII century. The project was carried out by the landlord, the humanist Lodovico Sergardi, better known as Quinto Settano. He was a poet, a satirist and a promoter of artistic and literary associations, which used to take place in Catignano. Any fragrance, suggestion and corner of this evocative and refined residence let people experience the noble elegance of centuries-old history, characterised by harmony and exceptional beauty typical of the Tuscan land itself. During the wedding day, Villa Catignano provides the bride and the groom with a special treatment, offering the best service: professional transport services, organisation of catering, flower decorations, different live music options, photographic service, hairstylists, and anything required by the newlyweds and their guests. Any single aspect will be carefully and professionally managed in order to provide a perfect service and, consequently, to let the bride and the groom live light-heartedly the best day of their lives. Any wish can be granted at Villa Catignano; you can also rent the entire Catignano residence – Villa and Farm, which can host up to 90 people – to turn the wedding into an unforgettable and high-quality experience. Villa Catignano makes available all of its spaces for the wedding reception: the Vecchia Tinaia, a recently restored spacious room, characterised by rib vaults and original cotto tile floor, that can host up to 120 people for a sit-down dinner. The Salone Grigio can host up to 80 seats. 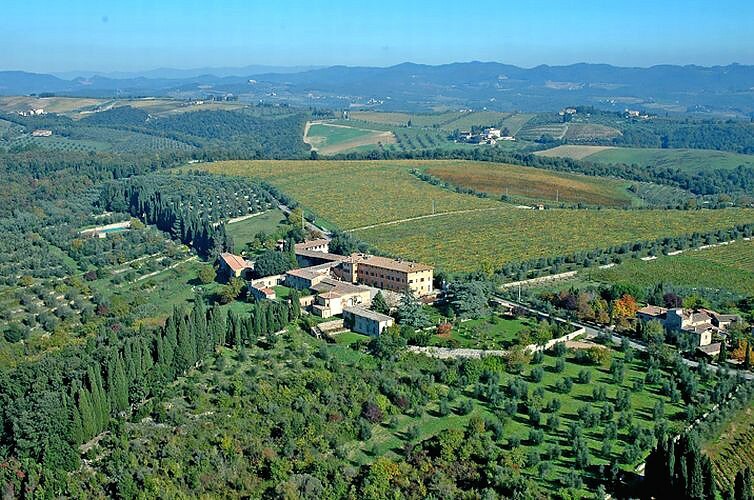 The spectacular terrace and the wonderful courtyards offer a view of the entire outdoor space, including the lovely Italian Garden, consisting of box hedges, holm oaks, lemon trees, and adorned by a suggestive cypress-lined path that leads to a panoramic viewpoint on the surrounding hills of Sienese Chianti and on the town of Siena, laid down in the distance. A reception in the Italian Garden may represent an original way for a couple to celebrate an informal-style wedding, without organising a traditional sit-down lunch. The old private chapel that belongs to the landlord can host Anglican or Protestant ceremonies, while symbolic ceremonies can be celebrated within the suggestive location adorned with the Statue delle Quattro Stagioni, which are the distinctive elements of the Italian Garden. Villa di Catignano has successfully passed the 100 Quality Controls established by the "Certification Protocol of Historic Houses of Excellence" and is properly certified by the ITALIAN REGISTRY OF THE HISTORIC HOUSES OF EXCELLENCE. The phone number of Villa di Catignano is +39 0577356744. The fax number is 0577356755.